1. You need a 3G modem. Not every modem works though. 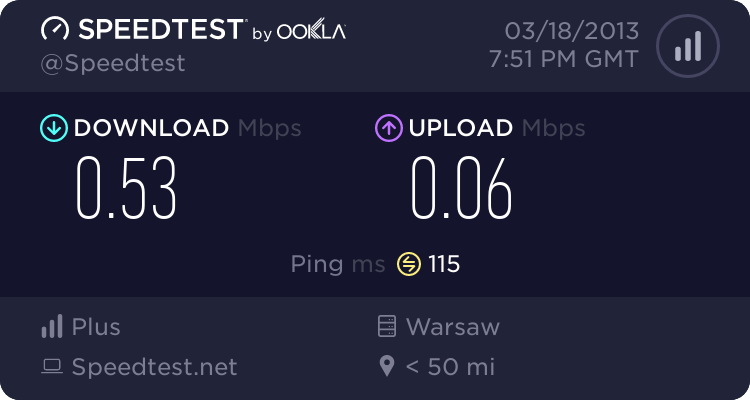 List of compatible modems is here: Aero2 – zestawienie zgodnych modemów. I have ZTE MF821. It costs about 200 PLN. 2. You need to pay 20 PLN. It's a deposit and it will be returned if you return your SIM card. 3. You need to fill in the order form and send it, along with printed confirmation of transfer of your deposit and copy of your identity card, to the address shown on their website. 4. After about one month they will send you SIM card. Of course you cannot make phone calls with this card - it is only for data transfer. 6. You have free Internet :) It's not very fast and will disconnect you every hour, but still usable for browsing websites. I think it may be useful when you travel e.g. in train or after you move to new house and don't have new Internet connection yet. So if it's so cheap to get it, why not give it a try?